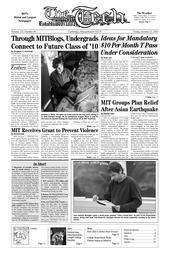 After an earthquake of 7.6 magnitude on the Richter scale struck Pakistan on Oct. 8, members of the Pakistani Students at MIT (PAKSMIT), immediately gathered to organize relief efforts. The group, which consists of about 20 MIT students, has set up collection stalls in Lobby 10, the Stata Center, and Building E52. United Nations and Pakistani officials reported a death toll of nearly 50,000 yesterday. Landslides and falling rocks have flattened parts of northern Pakistan and blocked routes, making access to help a challenge. “The amount of destruction is highly unimaginable,” said Faisal M. Kashif G, who is from Pakistan. His close friends and classmates have lost a total of more than 18 family members, and one has lost both parents, Kashif said. Some disaster relief events initially planned for Hurricane Katrina relief will now support victims of the Pakistani earthquake as well. Rany Woo ’08 began planning over a month ago for an event that will help both Katrina and Pakistan Earthquake victims. The Intercollegiate Benefit Concert, to be held on Nov. 6 at 3 p.m., will feature a cappella groups and bands from MIT, Wellesley College, Berklee College of Music, and Brandeis University. Tickets sales for the event start today in the Student Center, with a minimum donation of $5. Recommended charities for relief for victims of the Pakistani earthquake are listed on the PAKSMIT Web site at http://web.mit.edu/paksmit/www.